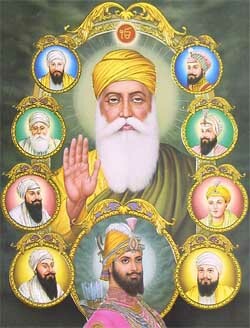 Anniversaries associated with the lives of the Sikh Gurus are referred to as Gurpurbs (festivals). Of these the important ones are the birthdays of Guru Nanak and Guru Govind Singh and the martyrdom days of Guru Arjun Dev and Guru Teg Bahadur. Guru Nanak, the founder of the Sikh faith, was born in a Punjabi village (which is now in Pakistan) in 1469. His birth anniversary, or Guru Nanak's jayanti, which falls in the months of October-November, is enthusiastically celebrated by Sikhs as gurpurab. Gurpurbs witness the culminations of Prabhat Pheris, the early morning religious procession which goes around the localities singing shabads (hymns). These Pheris generally start three weeks before the festival. Devotees offer sweets and tea when the procession passes by their residence. The celebrations start with the three-day akhand path in which the Granth Sahib (the holy book of the Sikhs) is read continuously from beginning to end without a break. Conclusion of the reading coincides with the day of the festival. 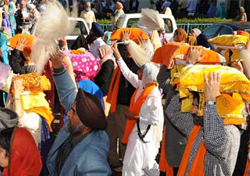 On this day the Granth Sahib is carried in procession throughout the village or city. It is placed on a float or a van strewn with flowers. Five armed guards, who represent the panj pyares, head the procession carrying Nishan Sahibs (the Sikh flag). Local bands are hired for playing religious music for the procession. Marching schoolchildren are a special part of the procession. Free sweets and langar are also offered to the general public outside some gurdwaras. 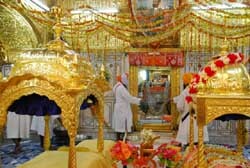 Sikhs visit gurdwaras (Sikh temples) where special programmes are arranged and kirtans (religious songs) are sung. Langar or community lunch is also arranged in the gurdwaras. The langar is open to people of all walks of life and of all faiths. It is served by local volunteers with a spirit of seva (service) and bhakti (devotion). At night Sikhs illuminate and decorate their houses and Gurdwaras with candles and electric lights. This festival usually occurs in the month of November (kartik). The Tenth Guru, Gobind Singh, was born on 2 December 1666 in Patna (Bihar). His Guruship is highly significant as he forged the distinctive identity of the Sikhs with five K and called gave the name Khalsa (the pure) to his followers. His birthday, which falls in December, is also marked by prayer readings, kirtans and processions. The martyrdom day of the fifth Guru, Arjun Dev, is observed with prayers and processions. On this day stalls are erected on roadsides for offering kachi lassi (sweetened milk) to the thirsty passers-by to commemorate the death of the Guru who was burnt to death during the hot months of May and June. The ninth Guru, Tegh Bahadur, was beheaded in Delhi. His martyrdom day is also observed with prayers and processions. It occurs in the month of November.